Weeping is a mercy which Allah Subhanahu wa Ta'ala puts in the hearts of all of us. A person weeps because of some reason. At times one cries because of feelings of mercy and kindness; at times because of fear; sometimes because of fondness and often because of love; sometimes due to intense happiness; sometimes due to pain or sorrow; at times due to the oppression of someone. Besides these there is the weeping of taubah (repentance) which is an outcome of some sin(s) committed; another type of crying is due to nifaaq (hypocrisy), which is done for show, where one cries in salaah (prayer) so that others may feel that the person is crying due to piety, humbleness etc. ; also one other type of crying is for a request, for instance where one cries for a dead person without taking any remuneration; and another type is to cry for a remuneration where for example one is paid to cry at the house of a dead person as is the custom in some areas; one more type of crying is the weeping of acceptance where one sees another crying and after seeing this he also begins to cry in camaradrie, etc. Verily the best of weeping is out of fear of Allah SWT. He said, "Enough for now". When I looked at him I saw his eyes were shedding tears. My father said, "When Allah's Messenger became seriously ill, he was told about the prayer. He said, 'Tell Abu Bakr to lead the people in the prayer.' `Aisha said, 'Abu Bakr is a softhearted man and he would be overpowered by his weeping if he recited the Qur'an.' He said to them, 'Tell him (Abu Bakr) to lead the prayer. The same reply was given to him. He said again, 'Tell him to lead the prayer. You (women) are the companions of Joseph." The Prophet said: "Nothing is dearer to Allah than two drops and two marks: A drop of tears shed out of fear of Allah and a drop of blood shed in Allah's way. Regarding the two marks, they are: Marks left in the Cause of Allah and a mark left in observing one of the obligatory act of worship of Allah, the Exalted". The Prophets and their companions cried before Allah. Pious predecessors, likewise, used to weep so profusely, especially in their night prayers, that the hot tears would leave marks on their faces and wet their generous beards. It was narrated that Abu Hurayrah (may Allah be pleased with him) said: The Messenger of Allah said: "A man who weeps for fear of Allah will not enter Hell until the milk goes back into the udder, and dust produced (when fighting) for the sake of Allah and the smoke of Hell will never coexist." Narrated by al-Tirmidhi and al-Nasaa'i. If we really think about what will happen to us and how much we have transgressed, as well as us not knowing if our righteous deeds were accepted or not, we should always be crying from the fear of Allah. 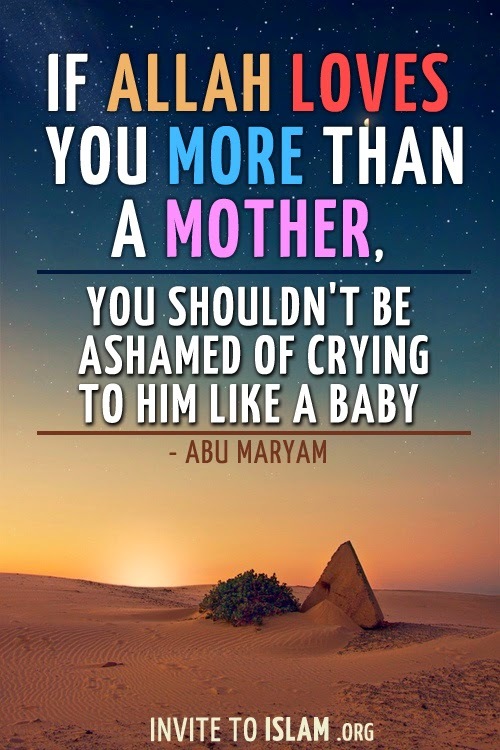 The most telling example of a man who few people would think that he might cry out of fear of Allah is `Umar ibn Al-Khattab (may Allah be pleased with him). `Umar was known for being strong, fearless, and uncompromising when it came to matters of faith. Despite that, it was related by `Abdullah ibn `Isa that he had two black streaks on his face as a result of constant weeping. `Umar's awe and fear of Almighty Allah was so intense that he once said, "If someone announces from the heavens that everybody will enter Paradise except for one person, I would fear that I would be that person." Thus, the strong `Umar was fearful of his Lord and His punishment to the point of weeping. Abu Bakr (may Allah be pleased with him) was also a great example of this. He was simply known for crying out of fear of Almighty Allah. These people were keen on serving fellow human beings during the day and invoke Almighty Allah at night in order to save them as well as all humanity from His Punishment. Let us contemplate the reality of the hereafter and let us invoke Almighty Allah to forgive our sins and soften our hearts. We have more need and urgency to contemplate and weep than `Umar and Abu Bakr ever had. Human beings are in turmoil. Only connecting with Allah wholeheartedly and begging for His mercy and forgiveness can bring us closer to Him and instill a sense of tranquility and softness in our hearts. The State Of Death | How Is Soul Taken?